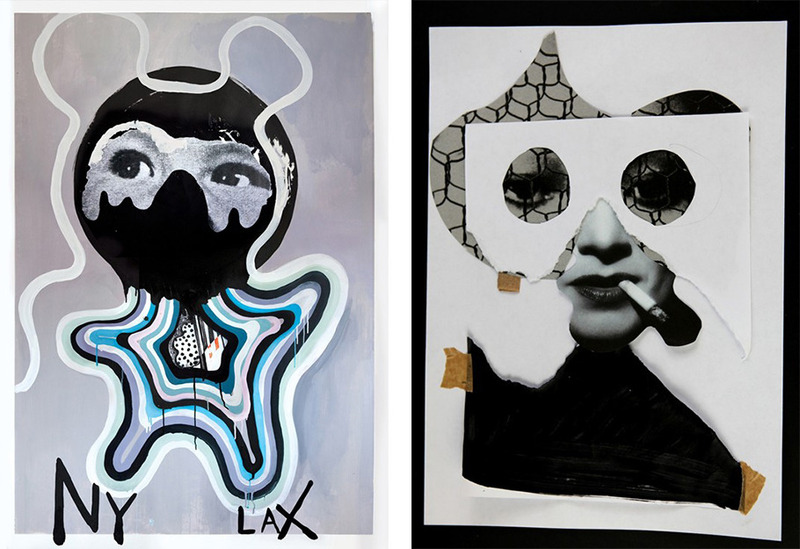 With an aesthetic that playfully merges the art and fashion world, multi-media artist Quentin Jones has become a rising star with a repertoire that includes cut and paste collages, fashion film, illustration, stop motion animation, magazine covers and more. The artist, in collaboration with talented set designer Robert Storey, debuted her new and first major solo exhibition The Fractured and the Feline at London’s Vinyl Factory. Though the inspiration behind Jones’ work spans from Robert Motherwell’s abstract mark-making and Keith Haring’s graffiti hearts to Dennis Hopper photography and Grace Jones’ album artwork by Jean Paul Goude, Jones’ thick, painterly ink illustrations are responsible for her signature element of surrealism and humor. In her notable body of work, she’s covered herself in layers of paint, tongue-tied Miley Cyrus in a fashion short film and has done ad campaigns for brands like Kenzo and Louis Vuitton. Jones enlisted Robert Storey, who is known for combining the art of sculpture and architecture in his set designs, to build the space for her exhibition. “The film rooms we are building will play animations that will reflect around the room on mirrors so the viewer really walks into the film, with the sound that Peter Duffy has edited together for me echoing around them in 3D space,” explained Jones in an interview with Dazed Digital. We’re pretty excited for this one. For those in London, The Fractured and the Feline: Quentin Jones with Robert Storey will be on display at The Vinyl Factory until December 13th.